In these waning minutes of 2014, I want to offer my thanks to those people around the world who let me share in their lives for a few moments or a few days this year. Because they were willing to tell me their stories, or let me into their homes and neighborhoods to document their daily lives, I had the privilege of passing on a glimpse of their experiences to a wider audience. Here’s a quick reprise of the year past, with photos from 12 countries. People living with disabilities in the Philippines – I photographed people with disabilities and their families in several parts of the Philippines this year, including taking a look at how they and their families fared in Typhoon Haiyan. One of the groups that impressed me most was Kaisahan ng Magulang at Anak na Maykapansanan (Kaisaka), a mothers’ group in the Malate neighborhood of Manila that carries out community-based rehabilitation with families that have members with disabilities. 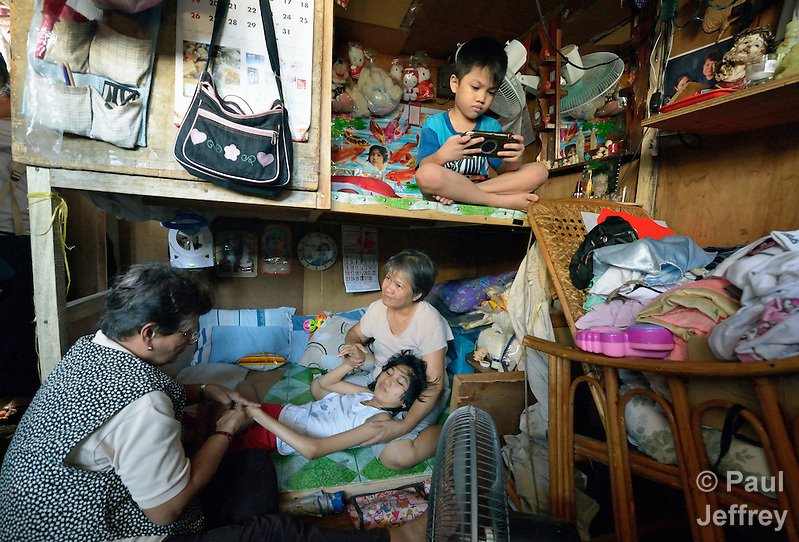 Here’s an image of Rafaela Valencia, a member of the group, exercising the legs of Susan Dison’s 15-year old daughter Susein, who has cerebral palsy, as her 7-year old brother Apo plays an electronic game in their crowded home. South Sudan – I spent a month in South Sudan documenting the violence and massive displacement provoked by an outbreak of political and ethnic violence at the end of 2013. It was heart-breaking to witness how the new country, which I have visited several times in recent years, so quickly broke into pieces because of the avarice of a few political leaders. I flew around the country, documenting both the trauma of the violence as well as the rapid response of church groups in helping people survive and lay the foundations for possible reconciliation. 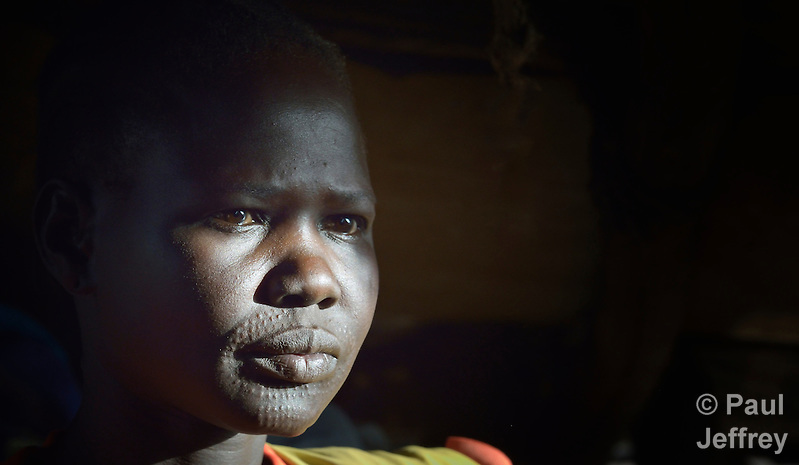 It was emotionally trying to hear testimony after testimony from people like Bewen Yuot, a Dinka woman who was displaced by fighting near her home in Bentieu. I found her living with relatives in Ajuong Thok, on the edge of a camp filled with thousands of refugees from Sudan’s Nuba Mountains. 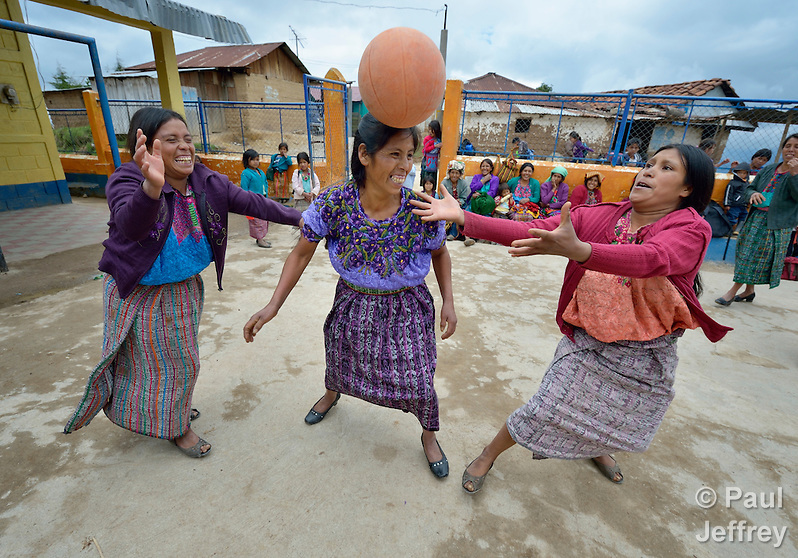 Guatemalan women – While documenting the lives of women in Mam-speaking Maya villages in the western highlands of Guatemala, I found a group of women playing basketball in the village of Tuixcajchis, where Maria Valentina Lopez appears to be heading the ball. People living with disabilities in Zimbabwe – Many people who use wheelchairs in poorer countries often get stuck with used chairs that don’t fit either their bodies or their environment. I had the privilege of documenting the life of several people who benefited from a program run by the Jairos Jiri Association with support from CBM-US. It got people chairs appropriate to their needs, and helped set up infrastructure to keep it happening. One of those who benefited is Hope Ranganayi, who suffered a spinal injury in an automobile accident. Today she uses a wheelchair to get around the National Rehabilitation Centre in Ruwa, where she studies purchasing and supply management. United Methodist Women Assembly – I hate photographing meetings, and generally avoid them. One exception is the quadrennial Assembly of United Methodist Women, which was held in April in Louisville. It’s a fun time, with dynamic gatherings that often make for decent photos. And this year Hillary Rodham Clinton was invited to give a keynote presentation. I got to photograph her backstage before her speech, including this intimate moment in a hallway with Yvette Richards and Harriett Olson. Richards is president of United Methodist Women, and Olson is top executive of the organization. 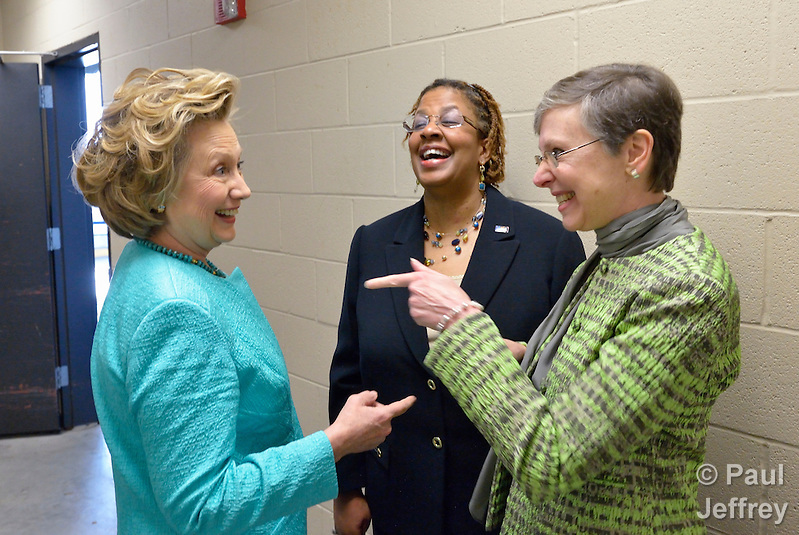 Clinton, of course, is a lifelong member of United Methodist Women. International AIDS Conference – I flew to Melbourne, Australia, in July for the 20th International AIDS Conference. I’ve covered several of these conferences over the years for the Ecumenical Advocacy Alliance, which brings together faith-based groups responding to the challenges of HIV and AIDS around the world. 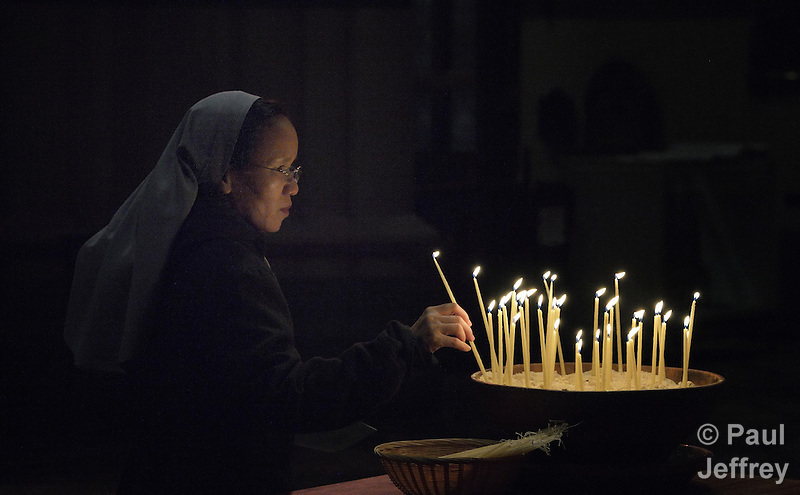 Here’s an image of Hien Nguyen, a Catholic nun from Vietnam, lighting candles at an interfaith service at St. Paul’s (Anglican) Cathedral. The event was a memorial service for those who have died of HIV and AIDS-related causes, and followed a march through Melbourne demanding an end to stigma and discrimination against those living with the virus, and a candlelight service in a nearby plaza. Here’s an article I wrote about the state of the struggle against HIV and AIDS. People living with disabilities in Uruguay – I went to Uruguay to document some of the work done by the Instituto de Buena Voluntad in Montevideo. Sponsored by the Methodist Church of Uruguay and funded in part by United Methodist Women, the institute works with youth and adults with disabilities. The institute has a Multi-Sensory Room, where I photographed Micaela Torrero relaxing. Outside the room, Torrero spends much of her time in a wheelchair. 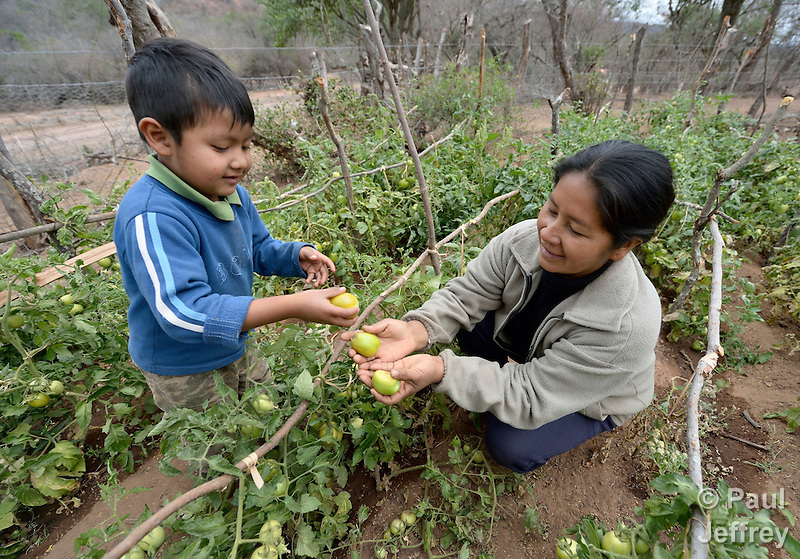 Food security in Bolivia – During a trip to cover the work of Church World Service in South America’s Chaco region, I met Johnny Antesano, a 4-year old Guarani indigenous boy in Choroquepiao, Bolivia, as he helped his mother Yela Vilera in their family garden. They and their neighbors started their gardens with assistance from CWS, supplementing their corn-based diet with nutritious vegetables and fruits. Land rights in Argentina – During the same trip, I met 6-year old Sara Torrijo, a Wichi indigenous girl in Santa Victoria Este, Argentina, as she played in a house she made of chairs and blankets in front of her family’s home. The Wichi in this area have struggled for decades to recover land that has been systematically stolen from them by cattle ranchers and large agricultural plantations, and with CWS’ help have recently achieved an agreement with the government and their neighbors that grants them control over a large region. Indonesia: Tsunami +10 – Following the massive devastation of the 2004 South Asia tsunami, I covered events in Sri Lanka and Indonesia. Late this year I got an opportunity to go back to some affected areas in Indonesia, documenting how the ACT Alliance had worked in ten different communities to help survivors rebuild their lives and economies, and looking at how effectively the mantra of “build back together” was incorporated into the work of NGOs and governments in the wake of the disaster. These three girls are walking to school in Tugala, a village on the Indonesian island of Nias that was struck by both the 2004 tsunami and a 2005 earthquake. The ACT Alliance helped villagers here to construct new homes and latrines, build a potable water system, open a clinic and schools and get their lives going once again. Typhoon Haiyan in the Philippines – Known locally as Typhoon Yolanda, this storm ravaged a wide swath of the central Philippines in November 2013. I was unable to travel there immediately after the storm, but in the course of 2014 went to the affected area on three different trips. So here are three images. 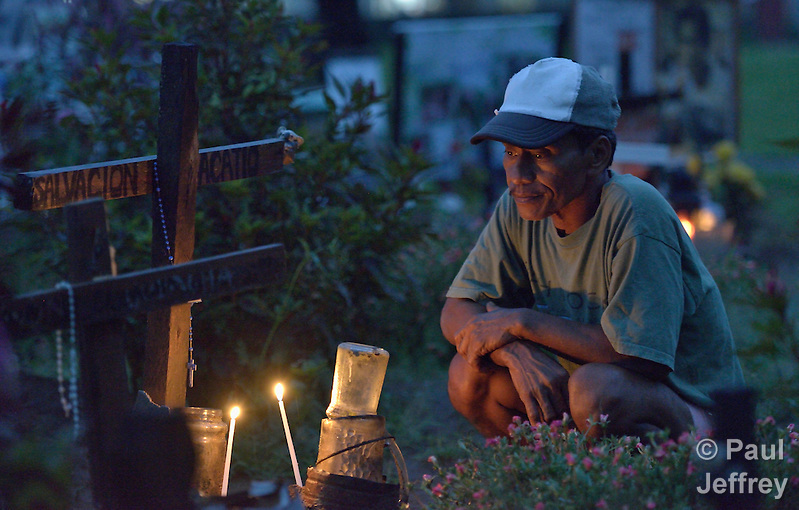 The first is of Pouldo Bacatio as he pauses to remember his grandmother Salvacion, who was killed in Haiyan and buried in a common grave in a church yard in Palo. 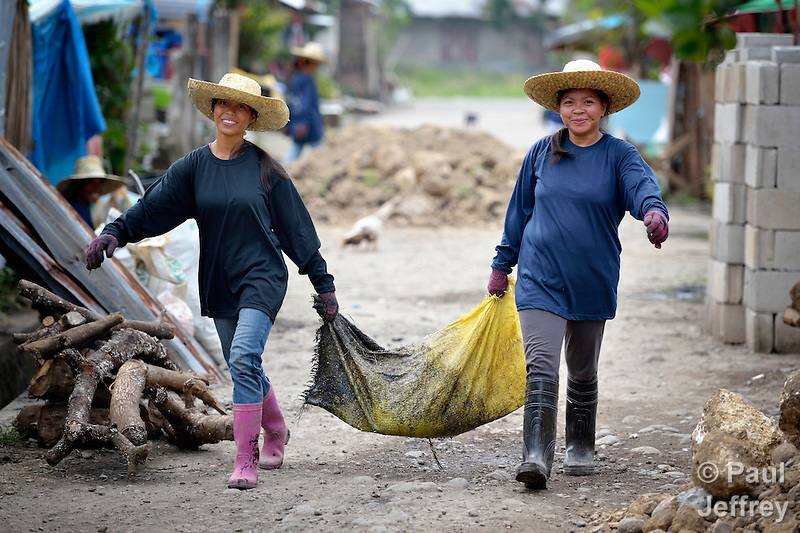 The second shows Merlita Abad (left) and Janilyn Canama as they help to clean up their neighborhood in Ormoc, part of an effort supported by the ACT Alliance. 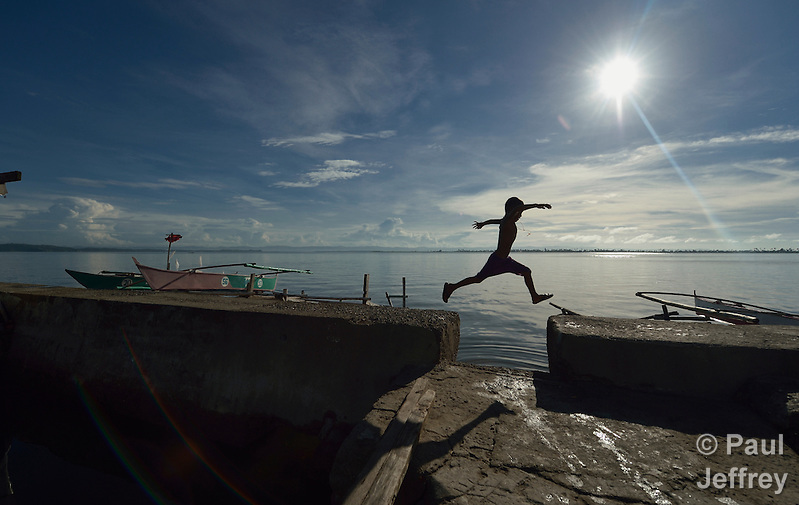 And the last image shows 7-year old Mark Dave Mortiga, nicknamed Pipoy, jumping a gap in a walkway along the sea in Tacloban, a city in the Philippines that was hardest hit by Haiyan. The storm surge buried this area with water, destroying the neighborhood. Despite a government prohibition on rebuilding within 40 meters of the shoreline, residents say they have nowhere else to go and have constructed new dwellings over the water. Coffee in Guatemala – I returned to Guatemala later in the year to document what coffee rust (Hemileia vastatrix), a terrible plant fungus, has done to the region’s most important export crop. 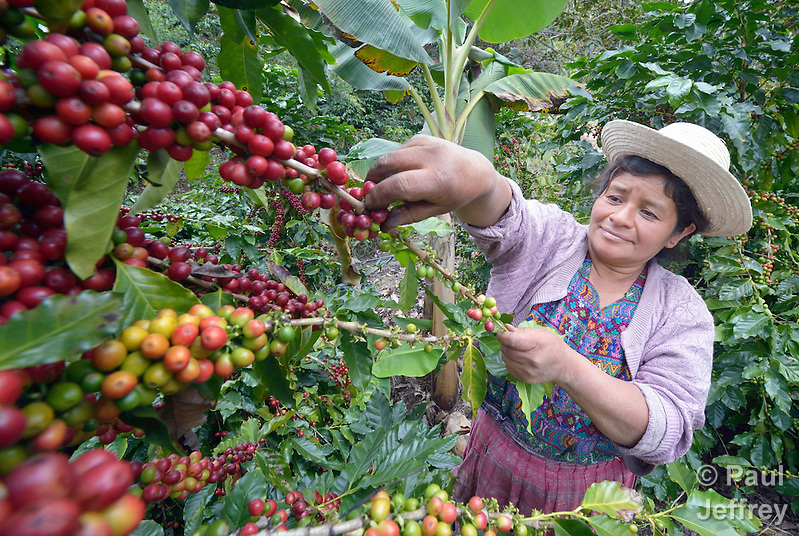 Here’s an image of Imelda Balan, a Kakchiquel Maya woman, as she picks ripe coffee beans in San Martin Jilotepeque. This farm used heavy spraying of chemicals to control the fungus. Youth in El Salvador – Since the U.S. government started shipping gang members from U.S. cities back to El Salvador as that country’s civil war wound down, many neighborhoods have been paralyzed by a violent turf battle between two major gangs, both with links to more traditional organized crime groups. I went there to document the work that some church leaders have carried out in fleshing out a short-lived truce of sorts between the gangs, and to look at other work the church is doing among at-risk youth. 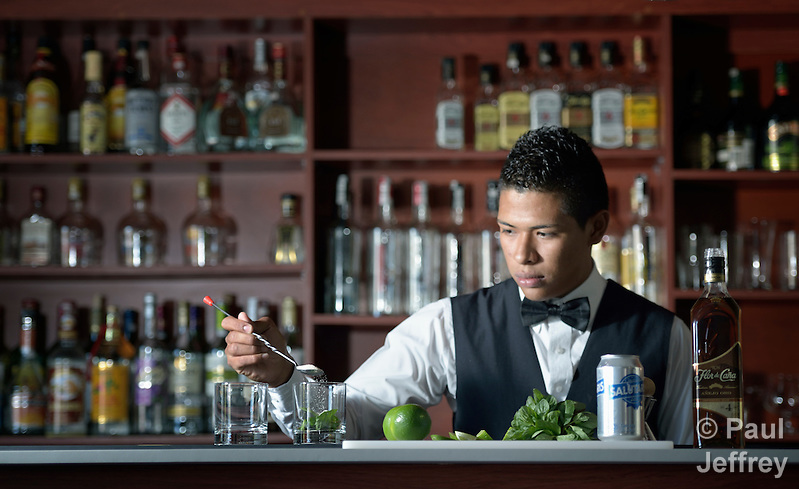 In the Mejicanos neighborhood, churches are providing skills training to young people like Eduardo Javier Contreras, 19, who’s learning bartending at a vocational training center run by the St. Francis of Assisi Catholic Church. He’s having a tough time finding a job, however, because many employers don’t want to hire kids from neighborhoods like his. Immigration in Honduras – I worked on several issues during a visit to Honduras, among them immigration, including the tens of thousands of children who’ve gone north in the last year. 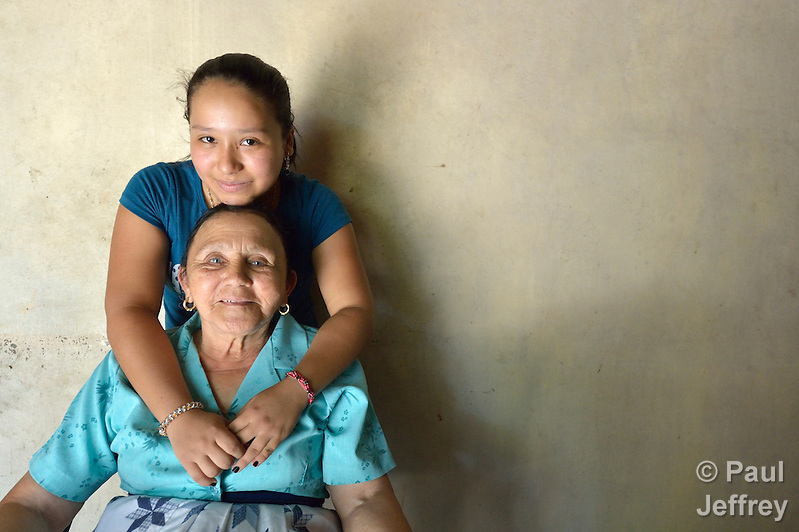 That research included getting to know Aleska Garcia, a 17-year old who here poses with her grandmother, Petronila Reyes, at their home in Goascoran, a hardscrabble town near the border with El Salvador. The teenager left Honduras in June to travel north to be with her mother, who has lived in the United States for 12 years, but Aleska was captured by Mexican immigration officials. After several unpleasant days in custody, she was deported to Honduras. For what her family paid the coyotes, she has the right to try the journey again, but she told me that for now she says she wants to remain at home and finish her high school studies. To all these folks and so many more, thanks for opening up your lives to me during this past year. I appreciate your trust, and promise to faithfully tell your stories. December 30, 2014 | Filed under Africa, Americas, Asia, Blog, Children, Church, Disasters, Environment, HIV and AIDS, Photography, Refugees, Uncategorized, War, Women. A meaningful year documenting important lives. Bravo. What a beautiful overview, Paul! This “year in review” is so inspiring and uplifting. For all the stories you’ve told and the people you’ve brought to our minds… thank you. It is a joy to witness your work. Here’s to a great 2014, and many hopes for 2015 to come! Beautiful pictures reminding us that we our a global community where injustice and joy are everyday events. Thank you for your diligence and sensitivity in your pictures and articles. You have opened the world to us. I’m a proud member of the UMC and UMW and the work we contribute to make lives better world wide.